One of the reasons that I wanted to go to Turkey was to visit Istanbul or rather Constantinople. I had never really ‘done’ Istanbul before – I had seen it for several individual days but I wanted to spend several days to do it thoroughly. In particular I wanted to viisit Constantinople, the city of Constantine, and to see what remained of the city that was the heart of the late Roman Empire. 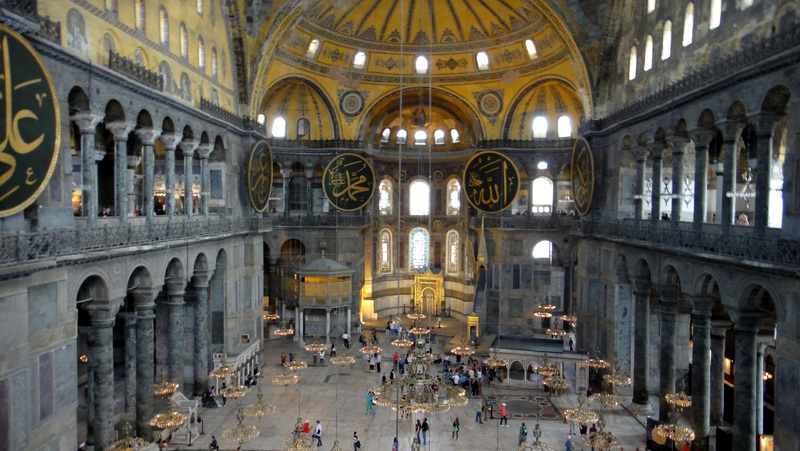 The most impressive site is of course the Hagia Sophia, the great church built by Justinian in A.D. 532-7, which is enormous. I suppose it is the only great building of the late Roman period still standing, and it still amazes by its size and power. 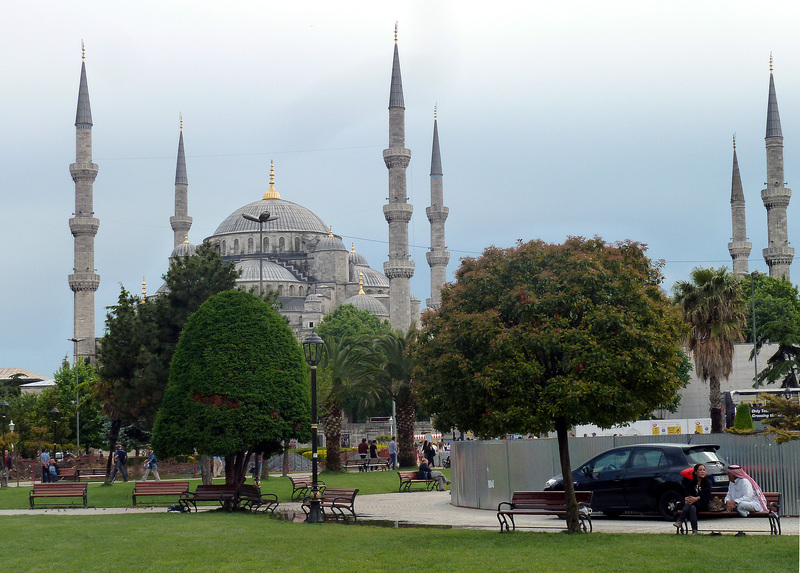 Then just over opposite it is the Blue Mosque built by Sultan Ahmed from 1609 – 1616, as a copy of the Hagia Sophia. It is indeed very beautiful and Christians and pagans and other heathens were allowed in at one corner so we could admire the interior. One of the sites I wanted to see was the Hippodrome, or Circus, which was in many ways the centre of the late Roman city. This was where all the best riots took place – football crowds are very well behaved as compared to the crowds in the circus, where the Blues and the Greens always took different sides in everything. 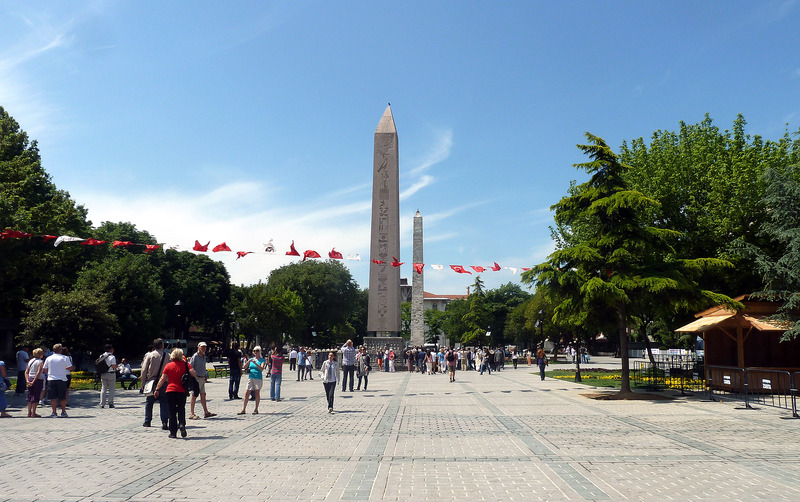 About half of the length is now laid out as a park with three columns still surviving more or less from the central spine. Our biggest surprise was to discover part of the Great Palace. 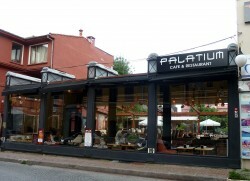 We were looking one evening for somewhere to dine and we came across the Palatium, cafe (right) which seemed in a rather modern building. 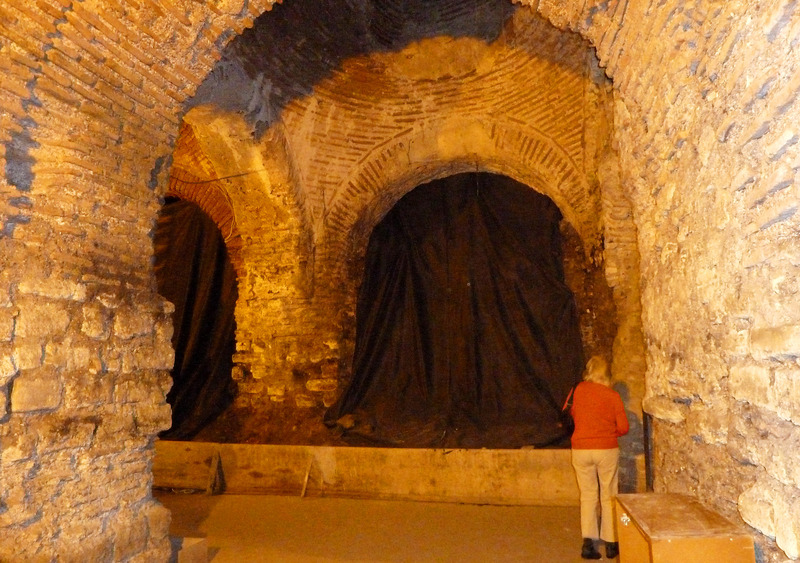 Imagine our surprise when under the floor we discovered a fragment of the Great Palace. 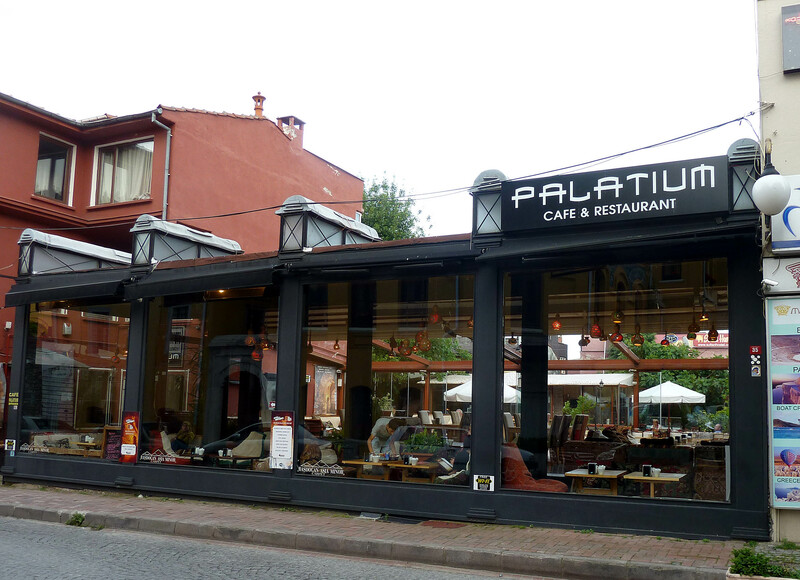 The owner of the restaurant had dug down – I am sure quite illegally – and had discovered room after room of what was clearly part – a very small part – of the Great Palace. One of the most remarkable remains in the city is the so-called Basilica cistern. This huge underground cistern was built by Justinian in A.D. 532 in order to provide water for the Great Palace. 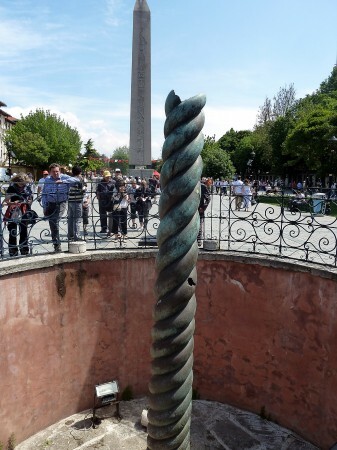 There are said to be 336 pillars in the cistern, all of them reused.After the Turkish conquest of the city in 1483, the position of the cistern was lost, but it was eventually re-discovered and in 1985-8 the cistern was drained, leaving only a shallow depth in the bottom, walkways were erected and it is now a popular visitor attraction. The pillars are all re-used – the Roman empire was now Christian, so they were happy to tear down pagan temples. Here we see a pillar resting on the head of a statue. Among the most remarkable remains are the great walls of Constantinople built originally by the Emperor Theodosius II between A.D. 412 422. We took a round-the-city bus ride, which went right along the length of the defences, some 4 miles or 6.5 km long, and from the top of the bus, I was able to take some remarkable photos. The wall was pierced by 11 fortified gates one of which can be seen here. This stretch has been heavily restore and most of what you see is in fact modern. The walls were hugely successful and withstood siege for over 1000 years: when Constantinople was captured by the Venetians in the Fourth Crusade, the attack came in from the sea, as they were unable to breach the walls. It was not until May 1453 that the Turks under Mehmet the Conqueror finally breached the walls, with the help of canons. But what of the Turks? 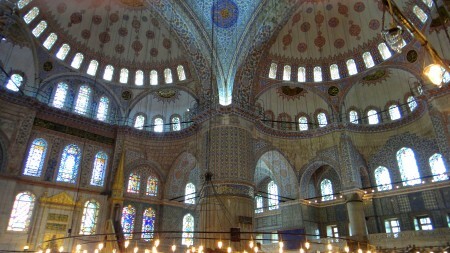 The biggest Turkish monument is the Topkapi Palace from where the Ottoman Empire was ruled for four centuries. I must say, the Topkapi was a disapointment. certainly is as a Palace it is a mess, a jumble of buildings with little overall shape. It was not grand at all but instead it consisted of a series of courts with a jumble of buildings, the best of which were ‘kiosks’ . 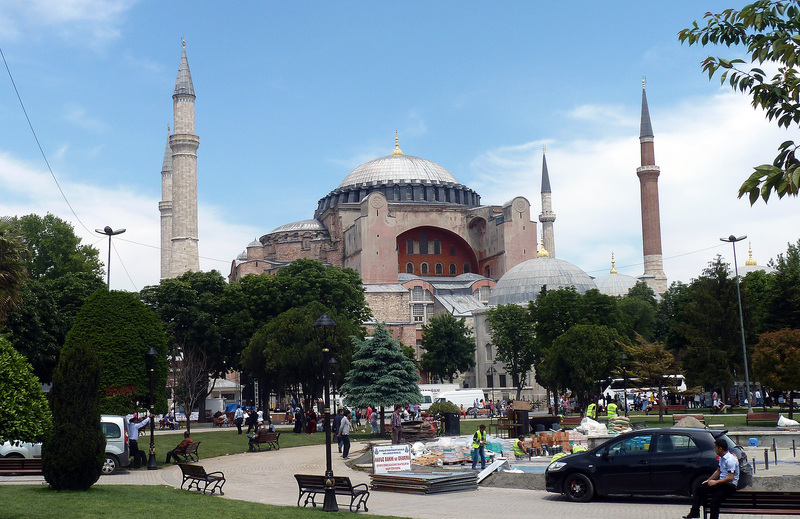 The site was chosen by Meymet the Conqueror between 1459 and 1464. The old Byzantine palace, to the west of the peninsula, had become ruinous so he chose a new site on the east of peninsula on the highest point of the hill which in fact the site of the original city of Byzantium. The finest architecture is to be found in a series of pavilions. This is one of the most beautiful, the Baghdad pavilion, situated in the Fourth Court, the most intimate of the courts. 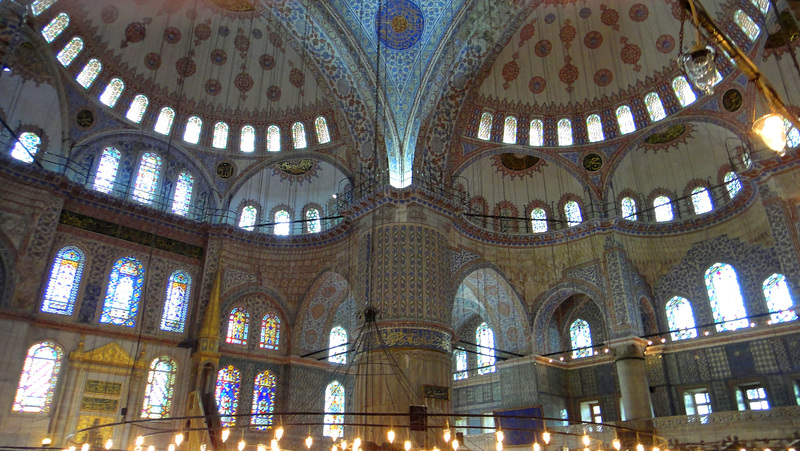 It was built by the sultan Murad IV in 1638 to celebrate the conquest of Baghdad. So that concludes my account of a very enjoyable visit to Turkey. I have lots more photos, — which sometime I would like to show you. On to the Byzantine harbour? Would you like to go ‘home’? Or how about a trip to India?